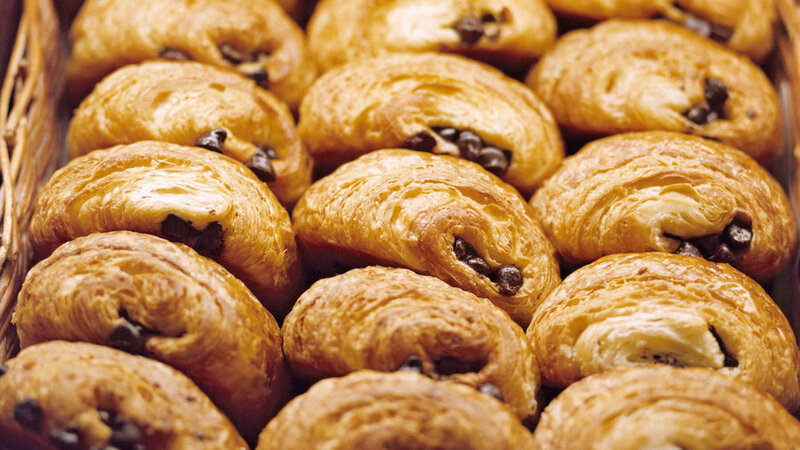 A freshly baked pain au chocolate and steaming latte from Le Panier make for a delicious start to your market day. You’ll hear people sing the praises of Arsicault’s almond croissant and morning bun around the streets of San Francisco. The tiny bakery started out as a neighborhood spot to grab a Sunday morning pastry, but it’s now a destination bake shop for its collection of laminated goods. Seating is minimal, so be ready to take your snacks to go. But why talk about the future when we could talk about the bread you can eat now? Flax Sunflower loaves! Available 5 (!!!!!) days a week all around the Bay Area. There’s a lot to love (and devour) at As Kneaded Bakery, but the shop prides itself on its naturally leavened sourdough loaves, classic French baguettes, and challah. Owner Iliana Berkowitz has an especially loyal fan base for her bostock—a thick-cut piece of challah with seasonal jam, in-house almond frangipane, and sliced almonds. Come to Baker and Spice with an appetite. The neighborhood bakery is known for its wide variety of cakes, buns, pies, cookies, and to-go snacks like granola. Be sure to order a Katie Bun (a croissant-like bun soaked with a gooey mixture of brown sugar, cinnamon, and golden raisins) and Garden Bread (carrot, zucchini, and almond quick bread) for the full experience. Arguably the most widely-known bakery in Seattle, Nouveau is a local favorite thanks to its massive twice-baked croissants. You can satisfy your craving for a flaky, buttery snack at any of their three locations. Bakeshop may not be the be the largest bakery in Portland, but what it lacks in space, it makes up for in craveable treats. The shop (which is mostly used as the bakers’ work area) uses whole-grain flours to make pastries from scratch, like their popular Figgy Buckwheat Scone. What started out as an unofficial pop-up in a home garage is now the indisputable best bread shop in Tucson. Don Guerra’s Barrio Bread uses local Arizona grains like Harvest Mesquite flour and Hard Red Spring wheat to make his loaves every morning, which range from classic baguettes and cubano rolls to einkorn bread and the signature Locavore boule. Some come for the fancified versions of childhood treats, like the signature buttery Nutella Pop-Tarts and caramelized coconut “Crack-a-roons.” But this Bernal Heights bakery also justifies a stop for owner Gillian Shaw’s less flashy sweets like the Coconut Cream Pie and any and all cakes—especially the Sour Cream Coffee Cake. Belinda Leong started a cultural phenomenon with her signature kouign amann, a crispy, buttery-smooth hybrid between a croissant and a palmier. But don’t stop there. Order a passion fruit bostock, banana-chocolate-almond croissant, and a pain suisse for the table to share. The Burque has been a farmers’ market favorite since they first debuted in 2015. Today, you can find their small-batch pastries at Downtown Growers’ Market on Saturday and The Rail Yards Market on Sunday. Take your pick from baskets of twice-baked almond croissants, slices of sour cream coffee cake, savory mushroom Danish, and more. At Chaupain, the smell of fresh hard-crust breads and baguettes fill the space. If you find yourself in Orange County, stop by for a chocolate-almond custard croissant, filled with homemade custard and topped with sliced almonds and powdered sugar. A sprawling layout of olive oil bundt cakes, crackle-top cream puffs, and cretzels (yes, a croissant-pretzel hybrid) fill the menu at Coyle’s Bakeshop. At this airy Greenwood district sit-down bakery, croissants are mixed and laminated over a three-day process using local Shepherd’s Grain flour and European-style butter from Wisconsin. Walk into this Capitol Hill bakery right off Bellevue Avenue and you’re greeted by a display case of small-batch treats: frosting-topped cinnamon rolls, colorful macarons, and chocolate-filled kouign amanns. But you heard it here: the pistachio croissants reign supreme. It’s a beautiful day for a lemon meringue that’s as delicious as it is pretty. Seriously, YUM. Stop by soon; we are OPEN for Easter this Sunday! The outside of Eva’s Bakery looks like you stumbled across a neighborhood patisserie in the streets of Paris. (Just look for the blue painted exterior and cheery yellow awning downtown.) The bakery makes French favorites like quiche Lorraine and eclairs, as well as fun croissants like a black pepper parmesan variety. Find some of the best breads and pies at this Sunset Boulevard restaurant in Venice. There’s both indoor and outdoor seating at the warehouse-like space, plus a bevy of sweets (baklava croissants! babka!) and savories (croque madame! baked eggs!) on the menu. If you’ve been to Hinman’s Bakery, you know it’s all about the pies. Savory, sweet—there’s no wrong choice. Take your pick from individual-sized hand pies in combos like spinach and artichoke or ham and cheddar, or switch to a mini dessert pie in classic flavors like blueberry. You’ll get the thick, buttery crust either way. Lux Central is a coffee shop during the day and a cocktail bar at night, but don’t discredit the baked goods here. The muffins are moist throughout, and other items, like the berry cobbler, are more than worth ordering a few for the table. Head baker Avery Ruzicka is a legend in the pastry world thanks to her time at David Kinch’s triple Michelin-star restaurant Manresa and her own artisanal baked goods at Manresa Bread. Expect to see nostalgic favorites like monkey bread and chocolate croissants, as well as fresh loaves of bread and seasonal fruit Danishes. This Pearl District pastry shop is a Francophile’s dream. There’s just about every type of traditional French pastry at this two-floor coffee shop/bakery hybrid, from mini canalés and macarons to rose croissants and almond brioche. Bring your laptop or a book and stay a while at the downstairs work space. This Curtis Park spot is the quaint bake shop of your carb-filled dreams. Housed in a brick building with rolling pin-lined walls inside, the Denver favorite has one clear standout dessert: the Paris-Brest, a choux pastry filled with praline-flavored cream. Warm bread pudding, frangipane croissants, and fluffy morning buns make this San Francisco Mission District bakery a SF rite of passage. And while the pastries are top-notch, their country bread is, dare we say, the best bread outside of Europe. Weekend mornings bring a line around the corner at this smallish spot, so be prepared to wait a good 20 to 30 minutes. This elevated bakeshop knows how to make laminated pastries that will turn you into a repeat customer. The morning buns are a hit, but so is the olive oil cake, which comes as a generous slice topped with brown butter icing.